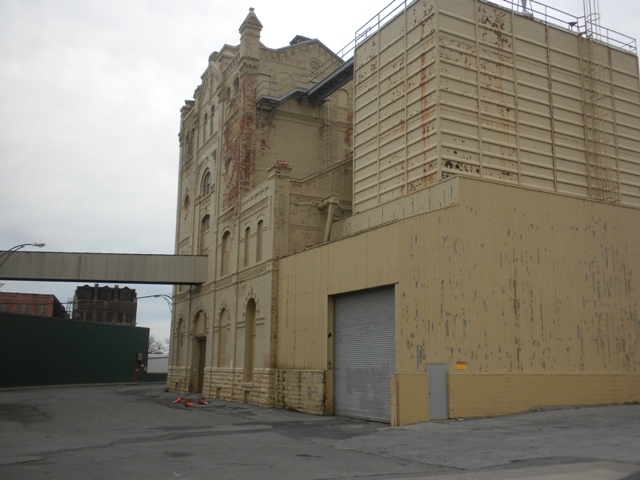 As the Rochester Zoning Board of Appeals reviews the Genesee Brewing Company’s application for a zoning variance so that they can tear down two of three historic landmarks on their property at Cataract Street in our city, let’s do the same and review the situation here. 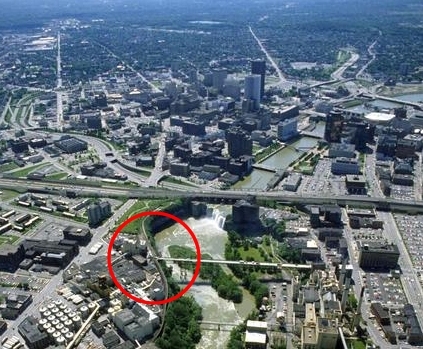 In this aerial photo, the building they will be reusing for their tasting room and visitors center, 25 Cataract Street, is to the left of the footbridge (once the Platt Street Bridge, now called the Pont de Rennes, in honor of a Rochester Sister City) on the eastern banks of the Genesee River. The landmark buildings they propose to demolish are to the right of the bridge, in that triangle of land against St. Paul Street that is part building and part parking lot. The best of the landmarks is 13 Cataract Street – that’s the one casting the longer shadow in this image. (Scroll down to see our earlier blog entries showing all these buildings, if you’d like). It dates from the late 1880s, and was designed by the noted brewery architect A. C. Wagner (also the architect for the Stegmaier Brewery in Wilkes-Barre, Pennsylvania, thankfully preserved and reused, and now on the National Register of Historic Places). The other building, 7 Cataract Street, is a two-story masonry construction built in the early 20th century. It was the bottling house. Two important facts refute this kind of rubbish. First, we did buy them, in a way. All of us citizens. When the NYC equity firm called KPS purchased Genesee Brewing in 2009, the City of Rochester gave them over $9 million in forgiven loans, water bills and taxes. Around Genesee Brewing, KPS created the North American Brewing Company, now the 8th largest brewery in the country. We’re glad for all their success, and all the jobs saved and created, but we do have more than a bit of skin in their game. And second, there is a little thing called the law. In Rochester, in order to destroy buildings designated of historic value, an applicant must meet certain standards. This applicant fails to meet these standards. Here’s why. Benefits. The benefit to the applicant if the variance is granted outweighs the detriment to the health, safety and welfare of the neighborhood or community by such grant. No problem here, since the applicant gets the benefits and we get, well, nothing. There will be no neighborhood left when they are done. Fail. 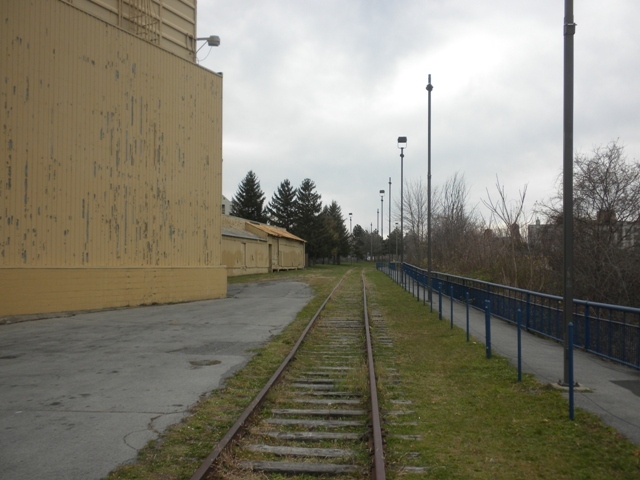 Essential character of the area. No undesirable change will be produced in the character of the neighborhood or a detriment to nearby properties will be created by the granting of the area variance. You decide this one. Would you call removing the neighborhood undesirable? Would you call a giant empty parking lot a detriment? 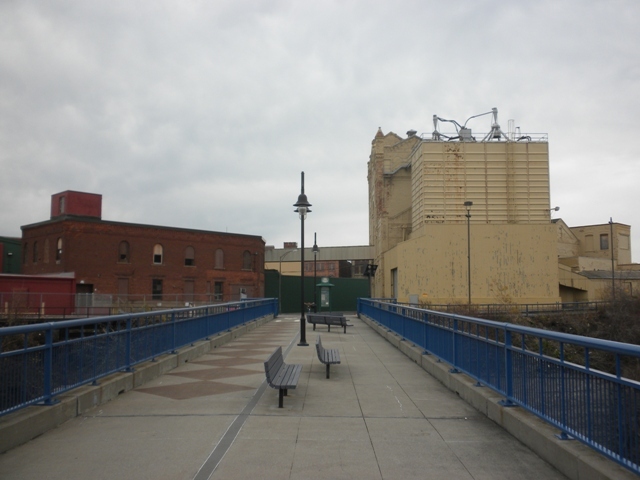 Would you call losing two landmark buildings in favor of – nothing – an undesirable change? Fail. No other remedy. The benefit sought by the applicant cannot be achieved by some method feasible for the applicant to pursue, other than the area variance. As we heard during the ZBA hearing on this matter, there are many other remedies still available. Some of them are being pursued even now. The applicant could yet: work out some kind of a deal for the buildings; stabilize the buildings for reuse as their success continues to brew; donate the buildings to a variety of interested groups. Too soon to tell about possible remedies. Fail. Significance. The requested area variance is not substantial. Physical and environmental conditions. The proposed variance will not have an adverse effect or impact on the physical or environmental conditions in the neighborhood or district. Look at the aerial image of the neighborhood or district. Imagine the physical environment without the landmarks, and with more parking spaces. We hold certain truths as self-evident. Fail. Not self-created. The alleged difficulty was not self-created, the consideration of which shall be relevant to the decision of the Board of Appeals but shall not necessarily preclude the granting of the area variance. When KPS bought Genesee Brewing, they knew that the buildings were designated as of historic value. They had been left uncared for, and after their purchase they continued to be uncared for. Now we hear that they are in such a deteriorated condition that they must be destroyed (this is patently untrue, by the way). Can’t have it both ways, brewery guys. Either you could have solved this “difficulty” by caring for the buildings, or you can solve this difficulty now by caring for these buildings. But if they are too deteriorated to save, exactly who else could have created that problem? Fail. So there are six standards under our law by which to test any desire to demolish the Cataract Street neighborhood. The applicant fails to meet all six standards. We’re brewing up our testimony for Thursday’s meeting of the Rochester Zoning Board of Appeals. We will speak firmly in opposition to the proposed demolition of 13 Cataract Street. And so, herewith, an invitation to the incantations. What: Zoning Board of Appeals, Thursday, December 15, 2011. Where: City Hall, Rochester, NY (a wonderful landmark structure). Council Chambers, 3rd floor. When: Their meeting begins at 9:00am. We are told that there are 5 items on the agenda, and 13 Cataract Street is 5th. So if you’re there by 10:00 or 10:30 a.m., there should be plenty of time for you to see and hear the action. It would be great to have the room full of those of us in opposition to this flawed and sad proposal. Come prepared to speak out if you’d like – 3 minutes maximum – or just come to offer moral support to the cause. It would be wonderful to see a crowd of neighbors. Join us. If you haven’t already, you might want to take a closer look at Mike’s site to see his Photoshop magic, as he gives us a few glimpses of what’s possible at this essential location at High Falls. Now we know who designed 13 Cataract, Philly brewery architect A. C. Wagner, and we hear again why we must save this building. Thanks, Mr. DeVolder. And in very late breaking news (late this afternoon), our local community college, Monroe Community College (MCC), voted this afternoon to move the long considered expansion of their downtown campus (they moved to the suburbs decades ago) to vacant space at Kodak HQ. 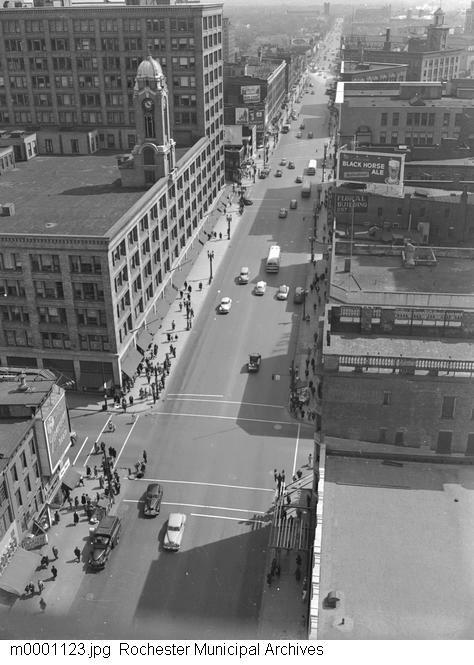 This is bad because they are now housed in the historic Sibley’s department store downtown, and their large presence there, near the Eastman School, would have really given a boost to that part of downtown. I pray we don’t end up having to rally to save this artifact of our downtown’s past. Our mayor wisely urged them to stay at Sibley’s, but they chose otherwise. Sibley, Lindsay & Curr, on the left in 1948. But the good news is that their decision will now put thousands of (beer drinking?) MCC students two blocks from the High Falls, and three blocks from 13 Cataract Street. Genesee Brewing – opportunity knocks even more loudly. More as news develops. Onward. And since I am the beer holder this evening, let’s talk about a real beauty, 13 Cataract Street. This wonderful old and sadly neglected building is 13 Cataract Street, here in our city. The folks who own it plan to tear it down. A bunch of us, the “historical fanatics” as we’re known to some of our neighbors, want to see it stay with us. It is, after all, older than our grandparents – over 110 years old – and it would be a true folly to lose this wonderful trace of our fast receding past. Who wants to tear down their grandparents? 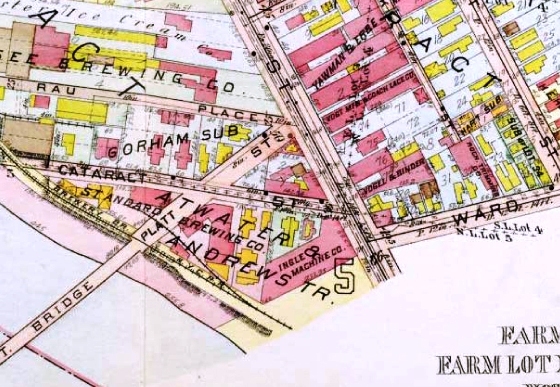 Our subject is underneath the W and the A in ATWATER, and was then a part of the Standard Brewing Co. campus. As you can see, in those days there was a kind of courtyard to the south, facing the river, and no carbuncle. 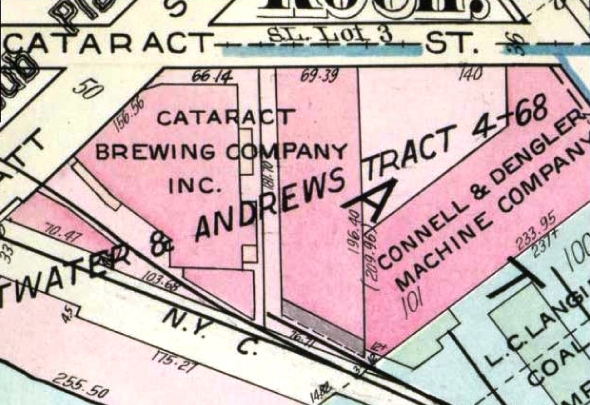 Standard Brewing had become Cataract Brewing. 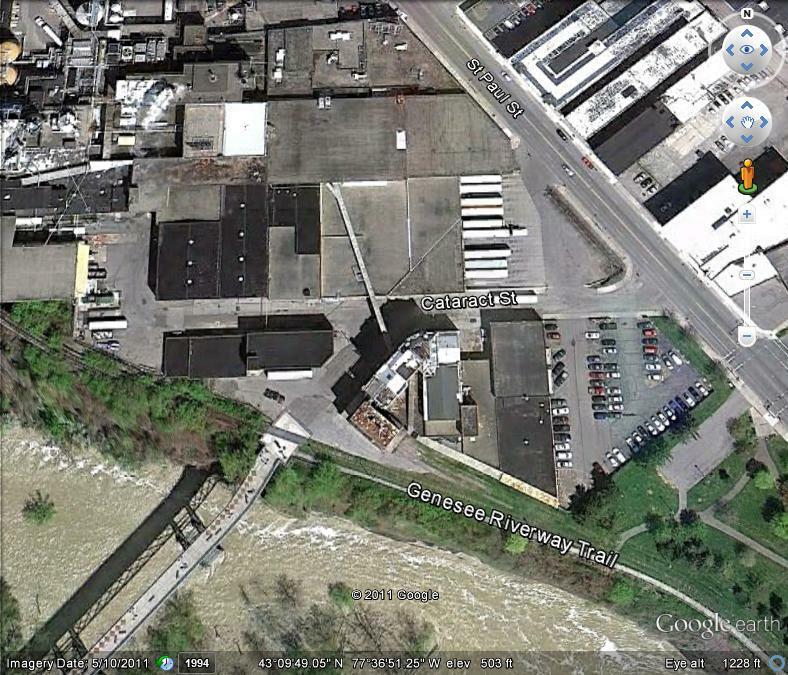 The new building to the east of 13 Cataract Street, also a landmark here and also slated for demolition, is narrow and very deep, running from Cataract almost 200 feet south to the railroad. So to begin to get at the beauty of Cataract Street, we need to get rid of all the crappy additions, and get back to the original fabric of the historic structure. All the stuff in the foreground, including the giant box at the left in this view, can go. And voila! 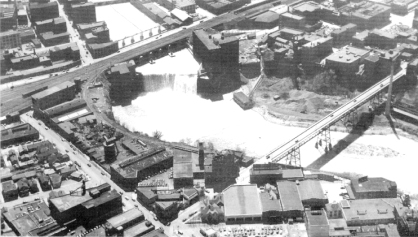 13 Cataract Street would have terrific views of the High Falls and the river, and would be a shining beacon at the eastern edge of the pedestrian bridge, the Pont de Rennes, which spans the river and offers incredible views of the Falls and all of the surrounding city. In those days, the bridge still carried vehicles. The fulcrum of space between 13 Cataract and its neighbor to the north is located at the right middle of the image, near the bottom. And oh, the beauty we can now beer-hold! 13 Cataract Street and its neighbors can now take their place in a larger vision for High Falls that includes the work already completed on the other side of the river, the soon to be redeveloped RG&E Beebee Station, the GardenAerial on the bridge, the trails looping the falls, the city park, the reused Gorsline Building, and all the other terrific and valuable things going on in this part of our city. In the last few weeks, we have been talking here about precious historic resources, the possibilities that a great old building represents, the very real value this building can embody for its owners and for the city, and the role that this place can play in enhancing our public realm. There are so many good reasons to save 13 Cataract.